This Quick Ship modern Sargasso home design exudes the spirit of comfortable relaxation in an efficient one-level plan. A large and open gathering area allows for informal seating and relaxing or eating before a roaring fire. The expansive wall of windows and door let in the view. A 364 sq. ft. screened porch and large deck area draw family and guests to enjoy the outdoors, day or night, rain or shine. The Quick Ship Modern Sargasso Elements Home is a variation on our Modern Elements Sargasso 1620 home. 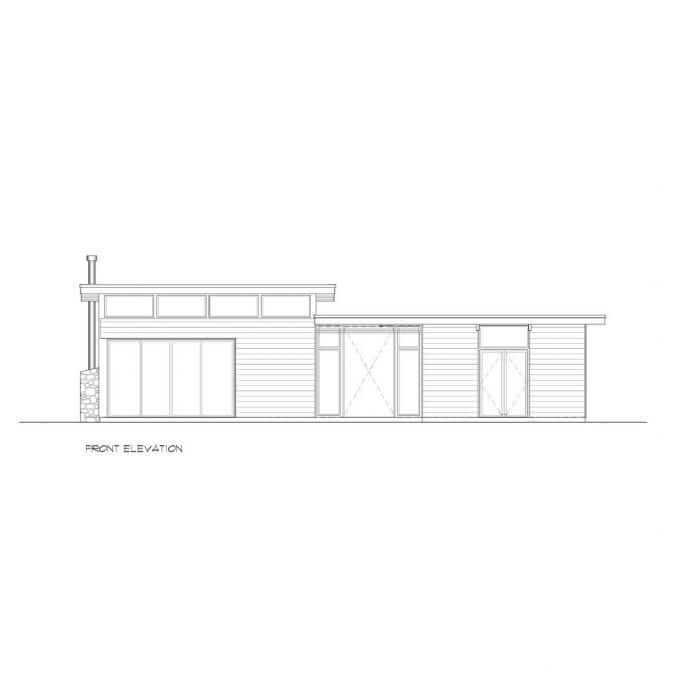 This version is available as part of the Lindal Quick Ship Program; a collection of best-selling homes already drawn to the final permit stage. Each comes with a menu of optional revisions. The option allow you to personalize your home in an efficient and cost-effective manner. Our Quick Ship homes are sold at a discount — subject to certain conditions — and can ship much faster than our more customized home packages. In the Quick Ship Classic Newport Home, the roof line’s distinctive double-pitch is reflected in the great room. This room is open to the dining room and kitchen. The master suite is located on the main floor. Upstairs, a guest suite has its own bath and a balcony with a view. This home design is a variation of the Classic Newport Home 38254, pictured above. The home is featured on page 160 of the Lindal Living Dreams plan book. Living Dreams is a hard-cover book of our classic homes and floor plans. Purchase a copy or view as an ebook. The Quick Ship Classic Newport Home 41784 is available as part of the Lindal Quick Ship Program; a collection of best-selling homes already drawn to the final permit stage. Each comes with a menu of optional revisions. The option allow you to personalize your home in an efficient and cost-effective manner. Our Quick Ship homes are sold at a discount — subject to certain conditions — and can ship much faster than our more customized home packages. A butterfly roof is the ultimate design element of the Quick Ship Modern Cascade 41777. This home is a variation on the Cascade 2493 (pictured above). The roof style had its heyday in the mid-century residential architecture of Southern California and remains popular today. It allows for higher perimeter walls and a band of clerestory windows for greater light penetration. The valley of the roof appears flat, but in fact consists of a viewing deck sheltered by a shed roof sloping to the view side of the home. The main floor houses a large master suite and office. Two more bedrooms are located on the upper level, one with its own generously sized balcony. A studio sits above the garage and is accessed from inside the garage. 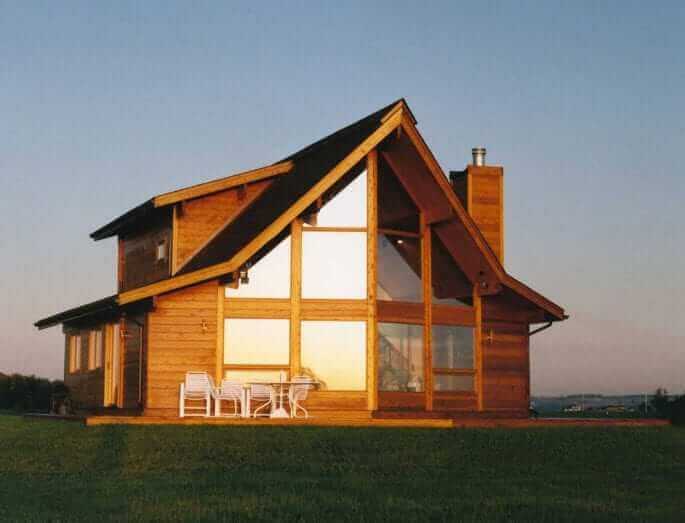 This home easily adapts to country or urban living. 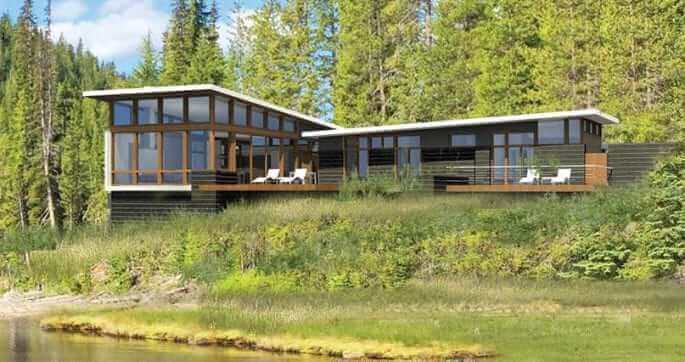 The Quick Ship Modern Cascade 41777 is available as part of the Lindal Quick Ship Program; a collection of best-selling Classic and Modern homes already drawn to the final permit stage. Each comes with a menu of optional revisions to personalize your home in an efficient and cost-effective manner. They are sold at a discount — subject to certain conditions — and can ship much faster than our more customized home packages. The Didyma (meaning Twins) is a single-story, continuous vaulted space with a master bedroom volume separating private from public patio space. The mono-pitch roof floats above a band of clerestory windows that flood the space with daylight. A horizontal level above the doors and main windows connects all the walls and flat ceilings. This results in a calm composition that anchors the main volume to the ground, while the two roofs rising in opposite directions create a dynamic visual crowning of the home. The Gamma 2297 is designed for a sloping view site; the design forms a tall great room with a bedroom wing. The two wings allow for a corner patio that extends the interior spaces to the views and enhances indoor/outdoor living. 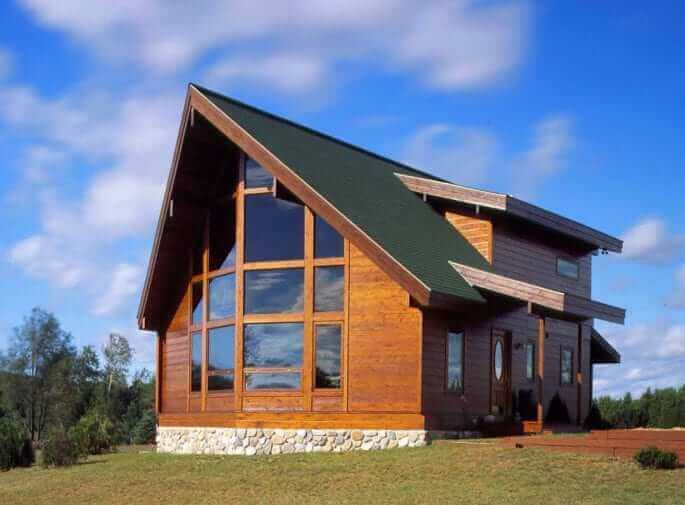 The right-angle arrangement affords an exterior view of half of the house from either side, with sloping or flat roof options. As with all designs, the Elements grid is expressed in the exterior design by the disciplined placement of doors and windows. 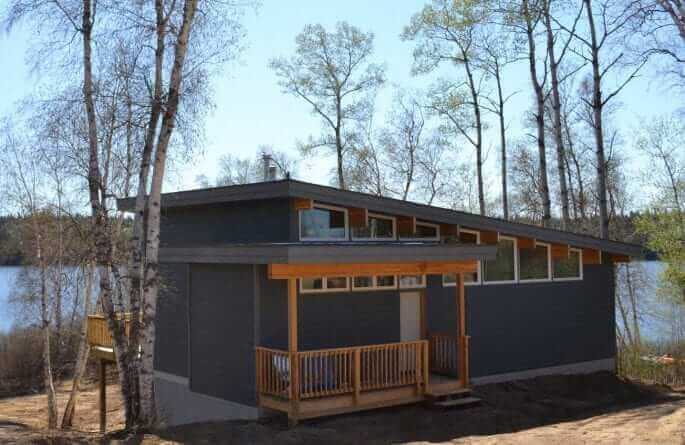 An original Usonian-inspired studio-home with a one master bedroom or two smaller bedrooms option, that creates a cozy space open to the landscape. The main space has taller ceilings and clerestory windows to bring in abundant natural light. Circulation is on the perimeter of the design to allow for an efficient use of the central core, in keeping with the classic Usonian layouts.